Answer: How much did it cost? As you might have guessed by the large yellow bat-logo-looking illustration, there's a comic book connection here. The fastest way to solve this problem is to break it into parts, then work from piece to piece. The first part is to figure out who Barbara Gordon is and why she'd be visiting Wayne Manor (and, assuming you're not a comics fan, figuring out what Wayne Manor is in the first place). I started by looking up Barbara Gordon with the query [ Barbara Gordon ]. As you can see, the results are dominated by Batgirl from the Batman series. Interesting, but if you don't recognize "Wayne Manor" as being the palatial home where Bruce Wayne (aka Batman) lives, then you'd be right to be suspicious. So let's try [Barbara Gordon Wayne Manor] and see if there's a connection. And once again, the combination of search terms makes it clear there's a plausible connection between the two. It doesn't take too many clicks before you discover that Barbara Gordon, librarian in Gotham City (and daughter of police commissioner James Gordon) is somehow linked to Bruce Wayne (aka Batman). Now, what's the deal with the book? Like most people who solved this problem, I noted that Wikipedia page names the edition of the comic book in which Batgirl debuted, DC #359 "The Million Dollar Debut of Batgirl" (Jan 1967). I did a search for [Million Dollar debut of Batgirl] and found that more than one person had scanned the comic book. I used: http://scans-daily.dreamwidth.org/2699468.html which just happens to have the important information contains a note from the editor indicating that in 1947 a copy sold for $151,000 at auction. [ 1947 book $151000 auction ] search results show the title of this rather expensive book as the "Bay Psalm Book," and now we're nearly there. The Wikipedia entry on the book gives us a second source identifying this as the book in question. A quick trip over to Google Books leads us to several facsimile copies of the "Bay Psalm Book." If you start reading the notes in the frontispiece, you'll find that the printer, Stephen Daye, and his printing press were brought to Massachusetts by the Rev. Joseph Glover, who, unfortunately, "fell sick of a feaver and dyed" just as the voyage to America began. The Bay Psalm book, was, incidentally, the first book published in the Americas. There may have been an almanac printed just before the psalms, but it seems to have vanished in the mists of time. It's fascinating to read a well-known text as it was written out at the time. Here, for example, is the 23rd Psalm. I've transcribed the spelling exactly as it appears in the Bay Psalms. For his names leade mee. And staffe my comfort are. So long as days shall bee. Search Lessons: Sometimes you've just got to go to the primary materials. In this case, finding the scanned version of the comic book gave us just the clue we needed to figure out that it was the Bay Psalms book. And then from there, going to look at the Google Books version of the book leads us directly to the original cost in an unexpected place. "A printing press was brought over to Cambridge specially from Holland, and 1,700 copies of the new Psalter were printed at a total cost of £33 for the lot, and the books were sold at 20 Pence each." Wednesday Search Challenge (5/30/12): How much did it cost? As readers of this column doubtlessly know, Barbara Gordon was bringing a book to the inhabitant of Wayne Manor when she realized that librarians could also become superhero crimefighters. The question of the day, though, isn't about superheros (although I truly believe librarians are superheros), but is about that book she was bringing to Mr. Wayne. How much did it cost to print the original 1600 1700 copies of that book in the first press run, according to the printer? I like this question as it links the Golden Age of Comic Books to American history in an interesting and unusual way. Yesterday’s search challenge varied from fairly simple to advanced. 1. Where was this photograph taken? Answer: Corner of Second Ave and 79th Street, Miami, Florida. I then followed a link to a news article about the making of the mural which told me the mural would be unveiled at 7925 NE Second Ave, at the corner of Second Ave and 79th Street. 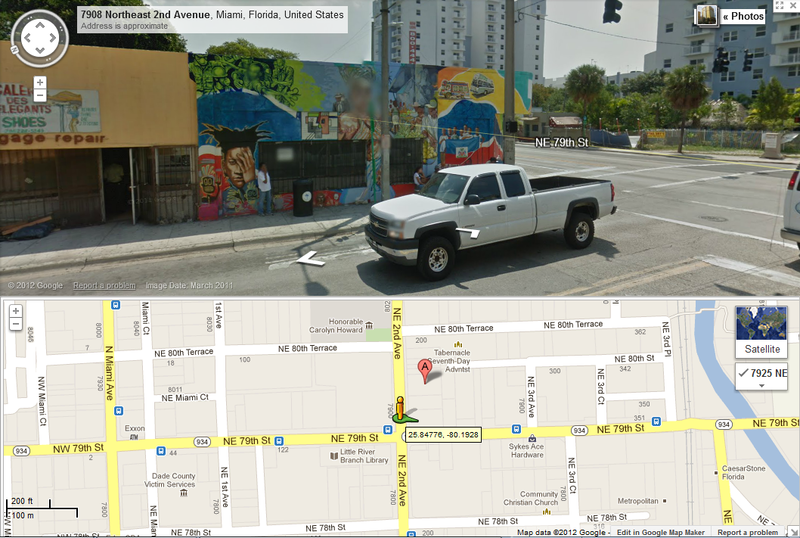 Using Streetview, I was able to find the location and confirm that yes, the entire mural is there. 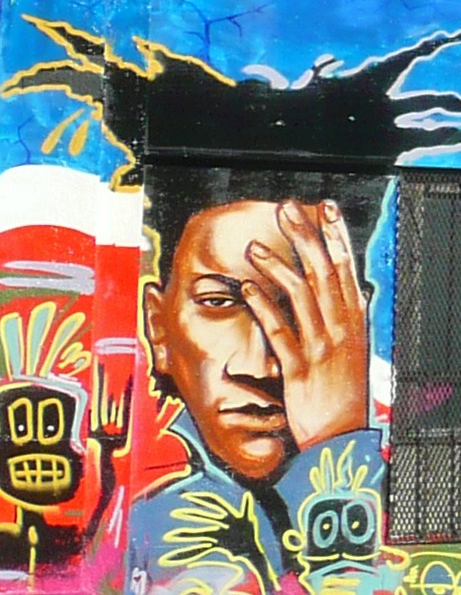 Looking around at a few other articles, I learned the mural is in the Little Haiti region of Miami (aka Lemon City)...but it’s not the mural on the Little Haiti Cultural Center, it’s just on the side wall of a store. In that article we find another picture of the entire mural, including the fragment in the question. Turns out the mural was a joint project of the Little Haiti Optimists Club and the MLK - Moving theLives of Kids - Community Mural Project. There are a set of interviewswith the different artists, but even listening to them, you can’t could narrow it down much more than that. 3. What two languages are spoken in the nearby high school? Okay…this is a slightly misleading question. Since the high school is in a largely Haitian part of town, you can guess that English and Haitian Creole are probably spoken. But how would you determine the languages that are *actually* spoken there? 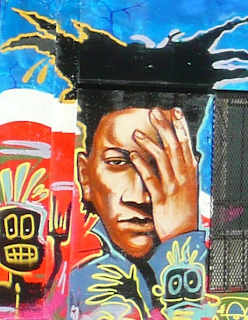 … which looks a LOT like the man in the mural. 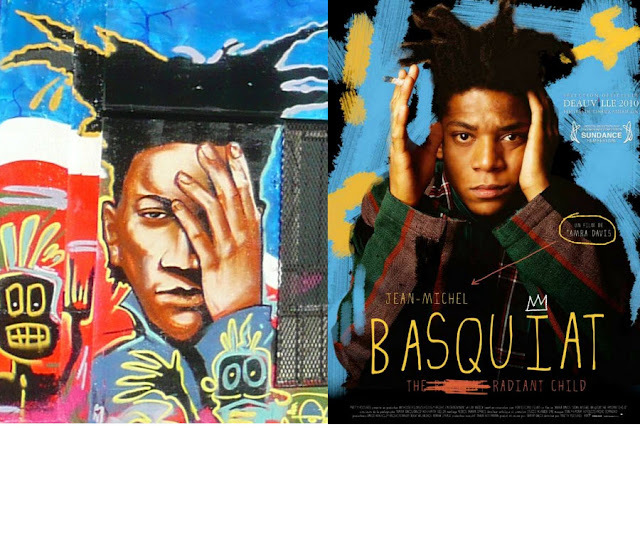 Of course, this doesn’t prove Basquiat was in on the mural production, but it makes sense to include such a well-known Haitian cultural hero in the mural! A. Remember you can search for locations by NAME in Maps. That's how we found the nearest high school. B. Don't suppose the question is asking the RIGHT question! When I asked for two languages, I was priming you to think there were only two. The truth is... there are three languages. Question the framing assumptions of the search task. Same comment about "who's the artist?" It wasn't done by one artist, but many. C. Remember that Search-by-Image can find parts of the whole. This won't always work, but when it does (as in this example), it's pure magic. Always give it a try. Sometimes it will amaze you. Wednesday Search Challenge (5/23/12): Who's the artist? I was sorting through some photos I happen to take a while ago and it happened again. I found this extraordinary picture of a mural. It's one that I really like, but I can't figure out where or when or who or what it's all about. Arrgh! As often happens with memories (and this is key in many difficult search tasks), I DO recall a couple of odd associated facts. (A) This picture was taken somewhere in the south. that had an interesting cultural mix. In particular, there were two languages spoken at this school (one was English). Can you help me out? The challenges here range from the simple to the complex. The short answer: This photo was taken in March, 2004. (I know, since I took the picture.) It was shot at the Matei airport on Taveuni, Fiji. The runway there is 910m long (2,986 feet). How to solve this challenge: In this case, all you know is that it’s somewhere with palm trees (given that it’s me taking the picture, probably somewhere in the tropics), and that the plane has a tail registration number. To get the rest of the story, you can check the Wikipedia page for Air Fiji tells the story. The company started in 1967, but foundered in 2009, selling off all 5 planes in its fleet. But for our purposes, the first photo on the Wikipedia page is a photo of a plane in a nearly identical location (by Herman Luyken). The interesting bit here is that the plane in the photo I took is in almost exactly the same spot as the Wikipedia photo. This lets us verify that it’s really the same South Pacific airport (and not some other random airport in the tropics). If you look on the Wikipedia page, for the Matei airport on Taveuni, Fiji, you’ll find it’s at 16°41′26″S 179°52′37″W, and the runway is 910m or 2,986ft. Now, how to determine the date? The folks who looked for a picture by me from a possible trip to Fiji did the right thing. It was a good idea, and it’s the first thing I would have done. Except I didn’t put anything out onto the web about that trip. And the people who looked for the metadata associated with the image (also called the EXIF data—see the Wikipedia article on EXIF) also had a good idea. Except I stripped out the EXIF data, just because I knew you’d be looking. You have to be a little careful about the EXIF since it can be altered on purpose (or just by accident when the image is edited). So how to get a decent date range? You also know that Air Fiji when out of business in 2009 and the plane was purchased in 2002, so it has to be between those dates. ...you can see that the background foliage is very, very, VERY similar. All of the trees are the same height, even the grass is pretty much the same between the two pictures. 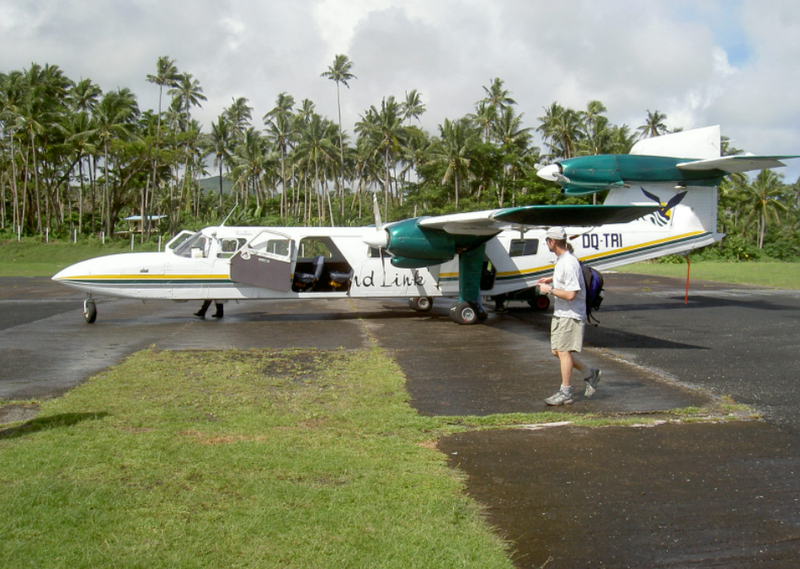 Then, if you do an image search for [ Matei Taveuni airport ] you can find other images from other dates (I could find ones from 2008 and 2004 easily) that let me see what kind of background foliage change had happened during that time. If you look closely, you can see not only that some of the plants had changed, but also the fence posts around the runway as well. In a more normal case, the EXIF data probably would have given you precisely the date. For the bonus question, I look at a hint from a previous poster, when he mentioned that a search for your dive trips didn't give much. I found a picture which listed a number of your fellow divers: "Divers in the photos include Harry Saddler, Dan Russell, Tom Gruber, Richard Santucci...."
So I did an OR search for all their names ["Harry Saddler" OR "Dan M. Russell" OR "Tom Gruber" OR "Richard Santucci" fiji ] and the term Fiji"
This leds to a picture by Tom on TraveloCafe: http://www.travelocafe.com/2010/08/best-scuba-diving-destinations-in-world.html korffr continues... .
Clicking on the picture goes to flickr, where this picture is part of a set taken in Fiji, which ranges between 16 March 2004 and 23 March 2004. SEARCH LESSONS: (1) Once again, using whatever small amount of text you have in an image can often lead you to the kind of repositories you need... in this case, all of the accumulated information about plane registrations. (2) Sometimes you have to look for the forest AND the trees, and by comparing information you get from multiple sources (e.g., pictures from 2008 or information about when Air Fiji bought that particular plane), you can get a pretty good boundary on the possible dates. (3) And... sometimes checking the trees means looking for friends who are on the same trip! Think strategically. Wednesday Search Challenge (5/16/12): Difficult--Where on earth...? I'm back from my travels, but I'm still in a vacation kind of mind-set. So today I've got a slightly more difficult problem for you. 1. Figure out how long the runway is? 2. What's the lat/long for this airport? You'll have to think like a detective to figure this one out. As you know, one of the things we're doing is creating materials for students and teachers to use to both LEARN how to search, and TEACH others how to search. So I'm happy to announce that we've just set up a new Google Search Education website as a part of the larger Google efforts on education. On this page we have links to learning/teaching materials (that is free and open for you to re-use in your classes), announcements of upcoming live and online classes, and a truly great video about why we're teaching people how to search. 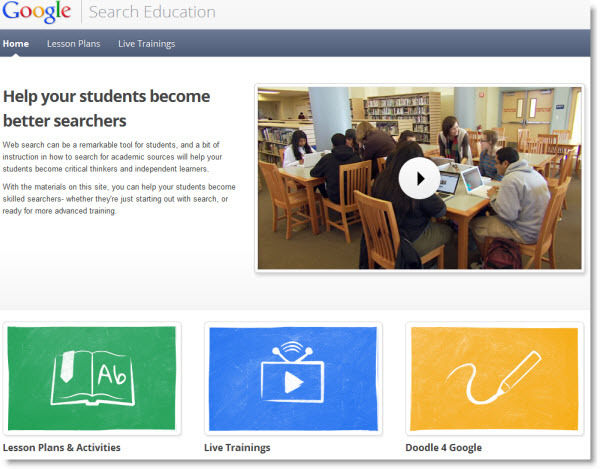 This is all part of the larger Google Education effort known as Inside Search. In addition, this site has our NEWEST updated teaching material: 16 lessons designed for teachers to use when they teach students how-to-search. From time to time I'll point to items on this page (new materials, upcoming classes) as interest warrants. Please share widely with anyone who's in the business of helping students (or friends, or neighbors) search! Answer: Where do the bats go? In yesterday’s challenge I asked a few questions about bats in Austin, TX. How did you do in answering them? Here’s what I did. 1. What kind of bats are we seeing (at the Congress Avenue bridge)? This is a pretty easy question. A quick Google search for [bats Congress bridge Austin] will quickly get you to some pages that describe the bats as “Mexican free-tailed bats.” If you then dig just one query deeper, say [Mexican free-tailed bat] you’ll learn from multiple sources that these are small bats that are known by the scientific name of Tadarida brasiliensis, also known as the Brazilian free-tailed bat. The Congress Avenue bridge is home to a colony of around 1.5 million bats (at the mid-season peak population). So the answer: Mexican free-tailed bats, aka Brazilian free-tailed bats, aka Tadarida brasiliensis. 2. What kind of bat is the most common bat in Texas? This is slightly more difficult because there are so many kinds of bats in Texas, and because the Austin population is so well-known and popular, you can imagine that some folks will immediately claim that they’re the most populous bat in the state. So a search like [most common bat Texas] gets to a bunch of resources, including pages about “most common bats in the US” (be careful to NOT read this as the most common bat in Texas!). But there are also a few pages from the Texas Parks and Wildlife department that assert that the Mexican Free-tailed bat is the most common. That’s good, but can we find a biologist who can give population statistics? One way to do this is to search for the scientific name of the bat (Tadarida brasiliensis) at EDU sites. For instance, the search [site:.EDU Tadarida brasiliensis Texas population] leads us to web pages as universities such as Texas Tech’s Natural Science Research Laboratory. 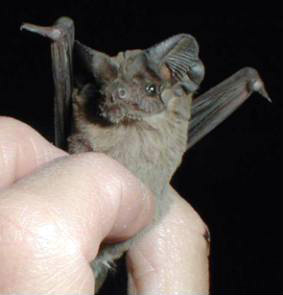 In their description of the “Brazilian Free-tailed bat” (notice that they don’t call it the Mexican free-tailed bat), they note: “...bats that inhabit Texas caves during the summer have been estimated at 95-104 million. The largest of the caves, Bracken Cave near San Antonio, is thought to hold between 20 and 40 million bats.” So while the population in Austin is big, it's nowhere near the biggest colony in the state! But a little looking around comparing different species of bats shows that the Mexican free-tailed (aka Brazilian) bat is clearly the most common bat in Texas. This is a bit trickier—we’re trying to figure out the names of places in southern Mexico and Central America. But it’s a little hard to search for something when you don’t know what it is! Even though this is a partial document for the longer paper, you can still read enough to find out that different bat populations move to different places for the winter. But the short answer is that some go to Sinaloa, Sonora, and Michoacan. Digging just one-result deeper confirms this finding, as this map (Figure 1 from the paper “Genetic variation and migration in theMexican free-tailed bat (Tadarida brasiliensis mexicana)" by A. L. Russell (no relation to me), et al. 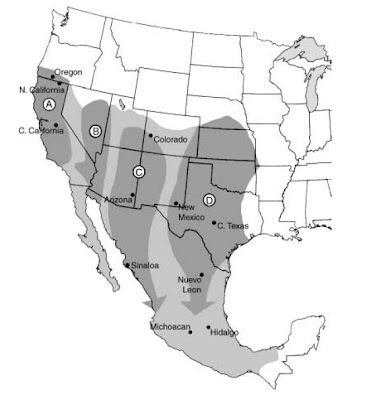 in the journal Molecular Ecology 14, 2207-2222 (2005) illustrates, the bats pretty clearly end up in central Mexico. Wednesday Search Challenge (5/9/12): Bats over Austin--where do they go? This week I’m in Austin, Texas attending a conference on Computer-Human Interaction, a place where we speak to each other in learned tones while trying to work out where the future of computers and people will go. And while that’s interesting, something else has grabbed my attention this week. As you probably know, Austin has a remarkable bat colony that lives under one of the bridges in the middle of town. Every evening at dusk, these bats pour out of the bridge substructure and into the sky to begin searching for insects. They go on insect search-and-consume missions, collectively eating something like 10 tons of bugs each night. In talking with people at the bridge, a couple of questions kept coming up. Can you answer these search challenges and help us understand a bit more about these bats? 1. What kind of bats are we seeing? Answer: From fish to football--what's the connection? Finding the publisher of the fish image is pretty easy. By now I assume you all know about Google's Search-by-image, and can drag that image into the Image search box to discover that it's from the book Historia Piscium by John Ray and Francis Willughby, published in 1686 by the Royal Society in the UK. The Royal Society recently released a set of online images from that text (along with select images from many other classic texts they’ve published over the last 400 years). The book, Historia Piscium, was written originally by Francis Willughby. This was all fairly straight-forward. In other words, early footballs were made from a bull’s privy parts, and at least occasionally had quicksilver (mercury) added to slosh around inside. Since mercury is so heavy, it would make the football fly rather erratically and wiggle back and forth on the ground, long after the last player had touched it! I imagine this made tossing the ball rather difficult, and it probably made the game hysterically funny to watch, as the ball would seem to have a life of its own. For question 4, it’s also not hard to search for [historia piscium publication] and find that the money for publication of the NEXT book by the Royal Society was fronted by Edmund Halley, he of Halley’s comet fame. Reading around in this hit list for a bit, you'll find that Halley had a longstanding relationship with Newton, and was really responsible for getting Newton to finish writing up his results in his book, Philosophiae naturalis principia mathematica (usually shortened to Principa Mathematica), a book which arguably changed the course of science by giving shape to a strong mathematical treatment of physical phenomena. And Halley was no slouch himself. Among other things, in 1691, Halley built a diving bell and dove 60 feet in the River Thames, and remained down for 90 minutes. His bell was of little practical use as it was very heavy, but he was later able to extend his underwater time to over 4 hours. However, not being aware of the practical value of his friend Boyle’s laws of gas pressure changes, Halley suffered one of the earliest recorded cases of middle ear barotraumas when he rose too rapidly from the depths of the Thames. This factoid is interesting to me right at the moment as I'm diving in Belize, making sure to avoid this same kind of painful middle-ear damage that Halley suffered while doing his studies. Search lessons: One of the more interesting aspects of being able to do this kind of linking / discovery search is to find unexpected connections. James Burke is probably the modern master of finding the quirky, odd, but sometimes essential connections between ideas. For a student learning about the history of ideas (or for an adult learner just trying to understand the world more broadly and more contextually), this kind of search is a marvelous tool. I hope you find these kinds of search challenges as interesting as I do. Knowing the connections between the Royal Society, Halley, Newton and Willughby (as both ichthyologist AND sports fan) just made my mental picture of the 17th century a bit more memorable. May all your searches do the same! Wednesday search challenge (5/2/12): From fish to football--what's the connection? I’m still in Belize, scuba diving with a few friends and looking at lots of fish. As you probably know, the study of fish has been a hot topic in science for many years. 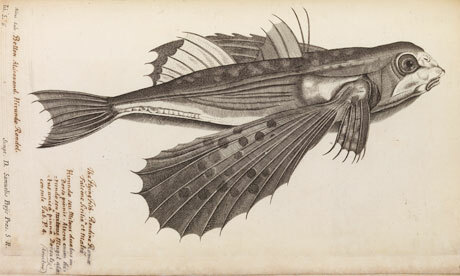 Here, for example, is an image from a 17th century scientific study of fish. Now the reason I bring this to you in a Search Challenge is that there’s an interesting story behind this picture. As I said, this book was published in the 17th century. Typically, publishers like to make a little money after the publication of a book, or at very least they want to break even. But in this case, the publisher almost lost everything putting this book out to print, which left them unable to fund the production of the next book. It turned out that the nearly-unpublished book was probably one of the most influential books in the history of science. Luckily, someone stepped in at the last minute and paid for the publication of book 2. 1. What’s the name of this book about fishes? 2. What publisher was nearly bankrupted by its publication? 3. The original author also wrote an early definitive study of games. to make it a little more mobile, and keep it from just lying there? money to pay for the publication of the NEXT book by this publisher? I know this all sounds improbable, but it’s a really fascinating set of interlocking stories. Try the search, and as usual, let us know the answers and how long it took for you to find them!